Google Chrome being the most widely used Web based browser has its positives and negatives and one such thing is the need of lots of Memory which will slowly decrease the speed of your Google Chrome browser and lead to lagging of your browser. Most of us would have faced this when many tabs are open in your browser it leads to increase in memory usage and slowing down of your Browser. So let me first explain to you How to check which tab or which process in Google Chrome is taking most of the memory and then let us see How to control or decrease Lag or memory usage in Google Chrome browser. You have to check the memory usage of your Browser as each tab can take upto 5 to 10MB of RAM which can make your system slow and depending upon the type of website the usage can increase. So if you are having 2GB or 4GB and some 10 to 15 tabs are open and you want to use some other application in your laptop or PC there is going to be a lot of lag because of the lack of memory available. The memory usage also depends on the type of tab which is open if a Video is being played, flash Ads or high resolution images are open then it will lead to lot of memory usage. You can check the amount of memory being used by each tab and know which tab is is the culprit. 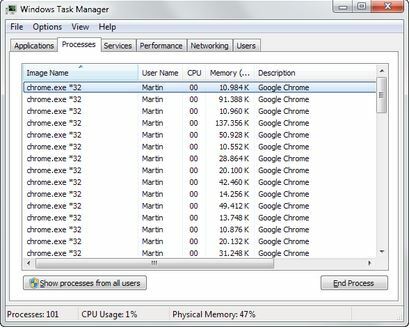 You can access Google Chrome Task manager by just pressing “Shift + Esc” and the Task manager will appear showing all the tabs and Extension which are open or running and the amount of memory being used up by them. As you can see from the image below all the details can be checked but you cannot close or stop the tab or extension from Task Manager. Just make a note of all the processes which are using up more memory and I will be showing you how you can control memory usage in Google Chrome. You can check the amount of memory being used by other browsers as well using this trick along with Google Chrome. This will help in knowing which browser is taking up more memory and causing the lag in your system. All you have to do is in Google chrome address bar copy paste this chrome://memory-redirect/ and press enter and you can see the Browser, Memory being used and the Virtual memory being used by each Browser. This every user might be knowing the Task Manager which can be used to check the processes which are running and the amount of memory being used up by each process. But in my opinion this is not as accurate as the above two tips mentioned because in Task manager the process is not mentioned properly and we cannot assess which tab or extension in Google Chrome is using up more memory to help close the tap or extension. Just press Ctrl+Shift+Esc together and the task manager will be opened where you will be given the list of applications which are running and from the tabs present above you have to tap on Processes which will show which processes are running and how much memory is being used up. This is one of the major factor leading to lag of your Browser where the presence of unused Extensions which are present from a long time taking up more memory. You have to go to the Extensions list and sort out the Extensions which you feel are useful and remove the ones which are not. To check Extension you have to enter this same text – chrome://extensions/ in the url or address bar and press Enter. Now you can deactivate or remove the Extensions form the list appearing. This will surely. If you are like me and have many tabs open at the same time then it will lead to a lot of Lag until you are having a high end RAM, if you are having 20-30 tabs open at any moment then there is going to be a lot of MB of RAM being used only for the tabs, and this is going to lead to a lot of Lag, so you can check the amount of memory being used up by each tab with the tips mentioned above and close the tabs which are not useful or taking up a lot of memory and only use them when required. There is another trick which can help keep a track on tabs without losing them with the help of an Extension called the “One Tab” chrome extension which will save all open tabs and make a list out of it to make it easy for you to launch all the tabs at once or to open only the ones required as seen in the image below. This will surely help save a lot of RAM usage and make your browsing and System usage a lot faster and easy. OneTab Extension also helps in saving the tabs which were open if you accidentally close your browser or any window. There are other Extensions too like “Tab Hibernation” which will Automatically make inactive tabs hibernate which will prevent memory usage by inactive tabs and these hibernated tabs can be opened any time you want. Or else you can make bookmarks of the tabs which are using up a lot of memory and open the websites only when required and not keep them open always. These are some of the simple tricks which will help you make your Google Chrome faster and also other Apps and Extensions on your Laptop or PC. If you are still having problems you have to check your system for any Virus or you have to change your browser.